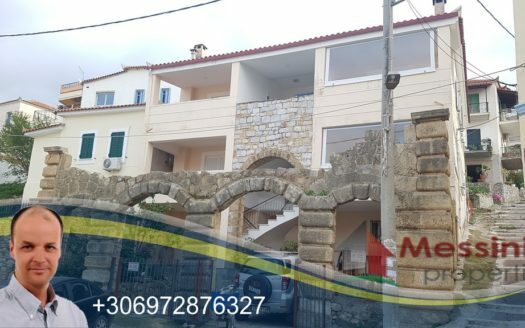 For Sale Villa in Koroni Messinias with spectacular view to Aegean Sea and just 600m from amazing beach memi – zagka. This robust construction sea view Villa with swimming pool is just 1,5km distance from Koroni. It is being built in a 4.000sq. m. plot and is total of 200sq.m on 2 levels. The ground floor consists of 4 bedrooms with 4 garderobes and 4 bathrooms. There is space for washing maching along with dryer and store house. The 1st floor consists of dining room – living room, shower, office and spacious veranda for your relaxing momments watching the sea. Distance from Kalamata and airport is 50km.